Anybody have one of these yet? https://lynskeyperformance.com/seque...ountain-frame/. Or opinions on what Lynskey has brewing with this frame? I ordered one and am going to be converting it to an XC/gravel burner with drop bars. Will update as it comes in. There's no shortage of gravel bikes or even drop bar 29er frames out there. This one has a "longer top tube" which means you'll need a super short stem and a giant stack of spacers on the steer tube to try and get the handlebars up high enough. Why do people always ask these questions after they buy it? Why not just buy a gravel frame that will allow a normal setup? Respectfully, I didn't start this thread to solicit approval or criticism from you or anybody else. This isn't an impulse buy: I've done my homework and have a plan. Rather, I thought, hey, there's a Lynskey forum with nothing on it about this frame yet. And why not start a discussion of that? With their recent sale on these, I almost pulled the trigger on a frame to build up for my wife. I ended up holding off to see if there are better holiday sales. I am interested in hearing your feedback once you get it. Last edited by Rockadile; 11-24-2018 at 05:30 PM. Okay, a discussion about an all mountain frame being turned into a gravel bike, go! I do not have this new frame but rather a 2018 Pro 29. I just want to say that after a remarkable first year of riding, the frame looks like it came out of the box last April. Just changed out the front rings from 26/36 and 11-40 to 28/38 and 11-42 so I got my first close up views since the bike first went into service. No issues discovered and I looked really hard. Finish is brushed and etched. Needed the change in gearing cause the bike is faster than I planned causing me to spin out so I added a couple mph of top speed. Best bike yet out of 24. Was built custom for Di2 XT. My frame came in, and I can report that workmanship appears to be excellent and weight (3.9 lbs.) is identical to Lynskey's listing. I’m getting a sequel too, used to have a trek 7.5fx 2008 which was an hybrid but I stopped dropping by the stairs with that one. Looking forwards for a more off-road bike I ordered a sequel, I’m thinking of using a bullhorn bar and hadn’t decided the wheel size. Do you have photos of yours? Yes. Just built up my XL last week and got the first good ride in yesterday. I really saw this as my high-mileage/XC rig, but took it on some more technical trails, with larger drops, tight downhill turns, etc. and was really blown away how capable this bike fealt. Anyways, built it up 1x11 with a 120mm fork. Sweet looking ride! How compliant would you say it is? In other news, I was comparing geo specs, and weirdly enough, the Sequel and the new frame for the Pro29 are nigh identical. In the medium size, the head tube of the Pro29 is 6mm more, but that's it, at least according to their website specs (side note: if the head tube is 6mm longer, how can reach and stack be the same?). The only other real difference appears to be which tubes get the helix treatment. So I wonder why they're marketing one (Pro29) as XC and the other (Sequel) as all-mountain? Some difference in ride quality? Further poking indicates that the Pro29 is Grade 5 titanium, whereas the Sequel is Grade 9 (https://titaniumprocessingcenter.com...de-9-titanium/). I wonder if that accounts for the price difference. Does anybody know if the ride difference between those alloys is detectable? Not that I care much, but I'm curious. I have Lynskey frames that are made from both and I don't notice a difference. If I recall correctly, the Pro frames only use the 6AI-4V for the top tube. One thing to note is that the Sequel 29 has 142mm spacing while the Pro is 148mm. You are correct in your recall. Only the top welded Ti is 6AI-4V but the down tube is a twisted tube, not welded like the top. [QUOTE=Jumbotron;13933813]Sweet looking ride! How compliant would you say it is? Not really sure how to interpret compliance. I will say it is still stiff and responsive when reacting to pedaling force, but still fealt somewhat softer and less jarring when going over rough sections of trail. I am running a Maxxis Ikon 2.1 rear at 30 psi (2.35 up front) and it still fealt comfortable in this way. This is using stiff ENVE wheels too! Would imagine a large tire with less pressure would feel better. 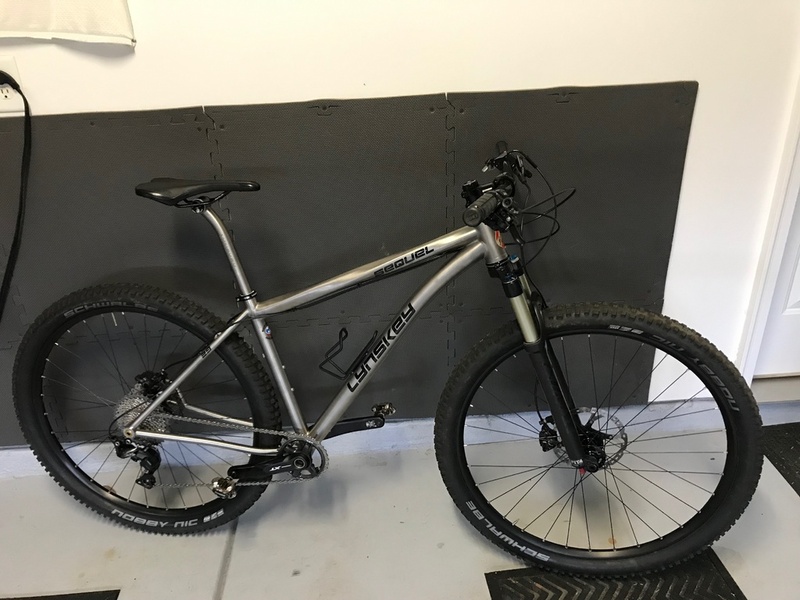 I have Lynskey Pro Helix road frame with the 6/4 Ti (top tube only) and do not think it adds that much to the stiffness (not sure what I am really comparing it too though). My understanding is they mainly do that for weight davings, but it is a more difficult grade to weld. I’ve got mine in 1x11 too but I feel that I’m spinning out but I wouldn’t know if a front chainring of maybe 38 or 40 teeth fits into the frame. How many teeth do you have on the front? I'm running a 32T chainring on a crankset with a 49mm-ish chainline. I use a 11-42T cassette and agree that I could use some higher gearing on more open trails. I think a 34T or 36T would fit fine. 38T or 40T would really be pushing it, unless you increase chainline significantly, although, that may compromise things in the rear. You may want to consider changing your cassette if you do not have room for a significantly larger chainring. I have been happy with my 9-44T eThirteen TRS+ cassette on my other bike with a 32T and the 9T makes for a pretty tough high gear. I’m having that same configuration currently, rear cassette 11-42 and 32T at front. Indeed adding a 38 or 40 will compromise the chainline and will probably be a mess instead of a solution. I found the absoluteblack Oval chainring, my crank arm is 94BCD and they offer a 34T oval chainring which works as a 32T and a 36T in each phase, the teeth to teeth length is 151mm I measured the crank and frame and it shouldn’t compromise the chainline. There are some Oval chainrings with 36T and 38T 94BCD at eBay but the seller doesn’t have a teeth to teeth length and I don’t want to run into chainline issues. I’m going to give it a try, and maybe a later upgrade to the cassette you mentioned. Going back to the thread subject, I’m having my sequel frame with bullhorn bars which is a better fit for climbing, and the Oval chainring might not sacrifice the speed and let me spin out in open trails or going downhill. I just changed out my 26/36 11-40 to 28/38 11-42 all Di2 XT Syncro. That gained me a little better top end and leaving the climbing ability about the same. That is why I still use a double for the added range. Works great and is dead silent. I just ordered a Squel Frame, I couldn't pass on the price, i plan on XC with bigger tires. 100mm Fox with Shimano Xt M8000 ... 1/11 32T-11-40 will have to work for now. I also ordered the Ti post for it. This will my only geared , i am about 99.9 percent steel single speed. I've owned the MT29 and the Ridgeline , hope i like this one. Consider the 11-42 instead of the 11-40. I started 2018 with the 11-42 just recently. Weighs a tad more but the bigger jumps on the 42 are all at the top of the cassette. Another bail out gear will at some point be useful. Maybe even the 11-46. I like the feeling I can climb just about any grade, at least for awhile. Anyone tried it with the Helm 120? I'm thinking about building one up. JoeDaddy - I don't have a Helm on mine, but I would recommend going the max 120mm Lynskey recommends rather than the 100mm. Would love to hear about your bike once you build it up. Got mine together ... plan on taking it out and dialing it in today! Really nice. I see the top tube is twisted while my Pro 29 has the down tube tweeted. Please report on the ride. I bet it will please you. Safe Ride! Very nice indeed. The setback Ti post will definitely add some comfort. I just installed the 34t absolute black oval chainring on mine (direct mount). It clears the chainstays fine, but I think anything bigger would be very risky. Any idea what size of rigid fork would fit in there? I'm building mine up with a Niner RDO. Geo should be dandy with that. Thanks! Have fun with the build! When can the reviews be expected? 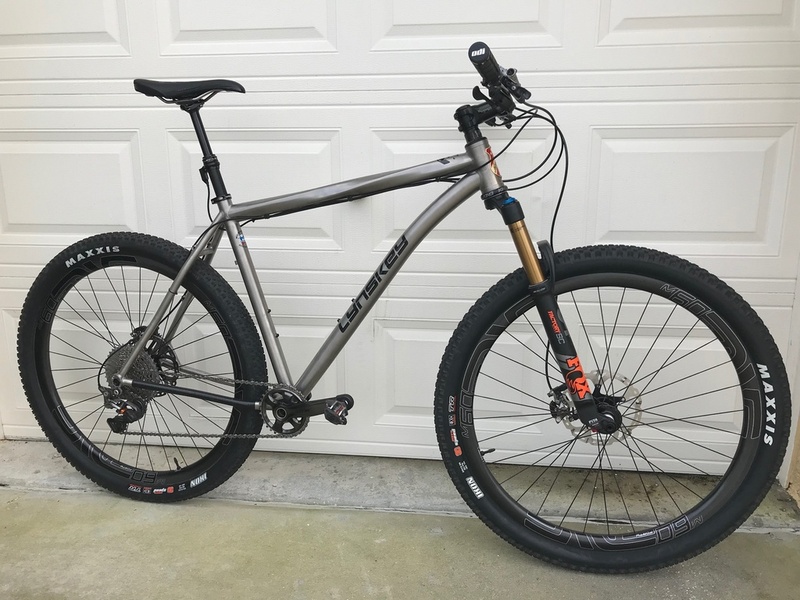 Building mine as a XC/Adventure Bike, I need to decide on a drivetrain and I am not thrilled with the fork because of the weight but it does allow for extra mounts and and 15MM axle so I can use an existing set of wheels. I will be riding in this in the Dk100 and would like to use it for long XC rides and possibly sections of the GDMBR. Here is a rough build list, give me some feedback! 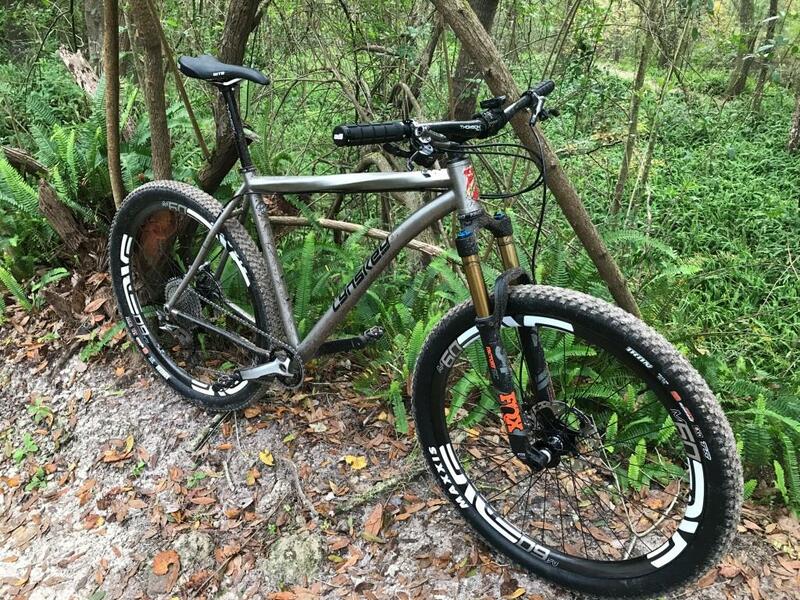 Frame Lynskey Sequel 29er Large Ti frame 4 lbs. axle to crown 483mm 2.5 lbs. Slow, but soon. It's taken me a while to acquire the parts, but the last of them (wheels and chain) should be getting in next week. Hopefully by the time the trails around here are ready, I'll have it done. I think I should have the fit in the right ballpark with a 70mm stem at 35 degrees with 10mm spacers under it, but I've got some room to play on the steerer. It's an experiment, but looking forward to trying it out. Will post pictures and impressions once it's up and running. The price on the Sequel frame is very tempting - I'm interested in more of a slack, all-mountain type hardtail, and curious to see if y'all have an opinion about this frame with maxed front suspension and a dropper post as working well for that type of riding. Thanks for the feedback! Now been riding my gorgeous new Sequel for a few weeks and am ready to share my somewhat uninformed opinion of how she rides. Had my first 'competitive' hit out on it this weekend in a local 4 hour marathon event. What I found was that the Sequel climbed brilliantly, especially out of the saddle. There was one specific steep pitch on every lap, probably only 20-25 seconds of effort, but the bike just gobbled it up. In the saddle climbing was also fantastic, with the feeling that all your energy was being delivered into forward motion. I must temper this observation by saying that I have spent the last 10 years riding a Titus Racer X dualie with 26" wheels. The Sequel also seemed to really carry it's speed on fire trails once you had it up and running. The only negative I found was with the MRP fork. On high speed descents it was a little shuddery (great word I know). However I am a bit of a nuff nuff when it comes to suspension, and haven't really taken the time to play with and dial in the fork. My criticism may be a bit unfounded, and I will update this once I have spent some quality time messing with it. I am not surprised about your report. Even though I own a Pro 29, all the Lynskey bikes I have ridden in the last five years mimic your reports except for the fork. These bikes sometimes get a bad rap for cracks but all bikes can crack and do. You have done very well. Some here have been waiting for some word on how the deal turned out. Do you have an updated pic to share? You are now ready for a great season of riding. Best way to start any year is riding a new machine. Great feeling when done right as you have done. After intially riding this bike and seeing how capable it was, I quickly added a dropper (KS Lev 27.2). I also have a Fox 120mm 34 Step-cast fork (120mm is max suggested travel). Now, even after this build-up I still wouldn't qualify it as a "slack" hardtail. The geometry is a little relaxed and with a dropper and 120mm fork, I would categorize it as more of a "trail" hardtail, but definitely not as slack and agressive as the new breed of "enduro/AM" hardtails that are surfacing and becoming popular. I think the Sequel is very balanced when built up the way I have it and can definitely be built up more XC, but not really much more enduro. I think this is mainly due to the head angle (could get a little slacker, rear tire clearance could be better for a 2.4, and also the top tube does not drop far down on the seat tube (reduces standover height). By no means am I knocking the bike because I absolutely love it. Here are some pics of the bike with dropper. My frame should turn up this week.. and looking to set up as XC bike.. not for racing, just fun. My understanding is ear dropouts are 148mm. Thanks and look forward to seeing more pictures..
What causes brakes to sequel so loud?